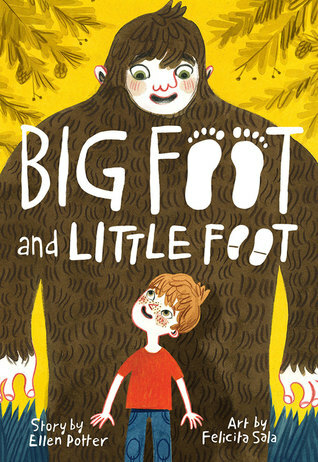 In this story of young Hugo, the focus is on a town of Sasquatch who live in a cave in the woods. They rarely leave the cave for the woods outside for fear of running into human beings. But Hugo is curious and wants to explore the outside world. When he sends a carved boat out of the cave through a hole in the wall, he doesn't expect it to come back with a message. And he really doesn't expect his new found pen pal to be a human boy. But after the boy calls him a liar for claiming to be a sasquatch, Hugo sets out to prove the boy wrong leading to a connection that the others aren't quite ready for. This is a delightfully adventurous new series for young readers who enjoy tales of friendship and exploration. It's also a tale of learning to reach beyond the known and try something new. 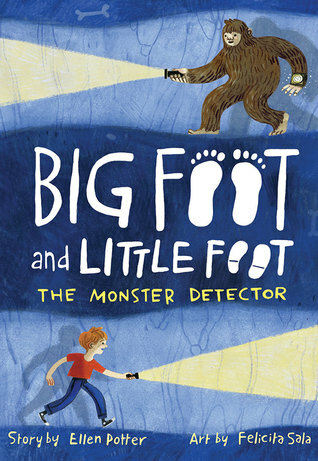 When Hugo, a young sasquatch, receives a supposed Monster Detector in the mail, he immediately sets out with his friend, Gigi, to look for monsters in the cave he calls home. What he doesn't expect is for the detector to go off leaving them at the mercy of a famous monster. When his human friend, Boone decides to start attending sasquatch school, he isn't well received. Both experiences and later discoveries leave Hugo to reassess just what qualifies as a monster. 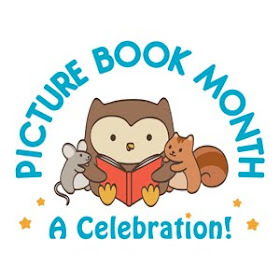 I enjoyed reading this story about Hugo and Boone as they face the prejudices of their own kind as well as the dangers of making assumptions. A solid entry in this fun new series by Ellen Potter.